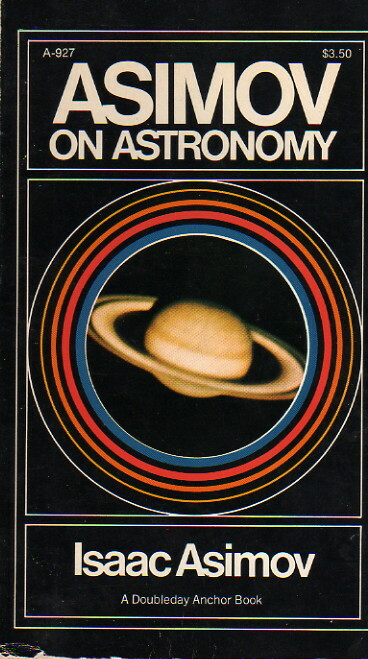 In this book Isaac Asimov uncovers facts about the solar system you may never have known before. Starting with the tides of the sea his discussion moves to the inner planets, the Asteroid Belt, the Gas Giants and, finally, the galaxy. Along the way, Asimov speculates on topics from extraterrestrial life to what a tenth planet might be like. Despite the fact that their contents are all derived from earlier collections, I would strongly recommend all four—they are invaluable reference material, for one thing. For others, the essays are updated, indices are added, and there are nice pictures with explanatory captions—so they’re even better books than the originals. Oddly enough, my copy of Asimov on Astronomy is, in fact, a paperback edition, even though the introduction by Asimov talks about the urgent need by Asimov fans to own all of his books in hard cover. The other three volumes in the series also came out in paperback eventually. Oh, well.